Europa League: Evra redcarded for karate kick – Royal Times of Nigeria. In Europa League first, veteran defender Patrice Evra was red-carded on Thursday for a karate kick at one of his own fans. This was before the Europa League match between his club, Marseille and Vitoria Guimaraes had even started in Portugal. 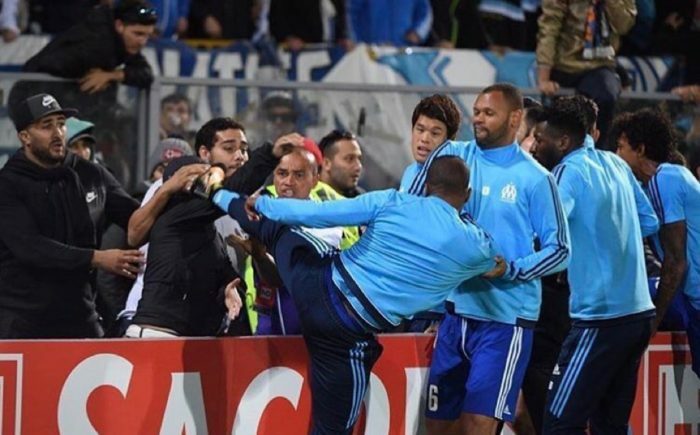 Evra , 36, a former Manchester United star was engaged in a heated exchange with a group of fans from an area reserved for around 500 Marseille supporters before aiming a head-high left-footed kick at one of them. Evra had been named as a substitute for the match and his pre-match dismissal meant that Marseille had to start the match with just six replacements. “Pat has experience, and he must not react, it’s obvious,” said Marseille coach Rudi Garcia whose side lost 1-0 and had Boubacar Kamara sent off three minutes from time. “Patrice is a more than just an experienced player. You can’t respond to insults as bad as they are and as incredible as they might be because they come from one of our supporters. The incident immediately brought back memories of another act of kung-fu kick madness by a French footballer. In January 1995, Eric Cantona, playing for Manchester United, launched a flying kick at a Crystal Palace supporter at Selhurst Park who had jeered him after he had been sent off.